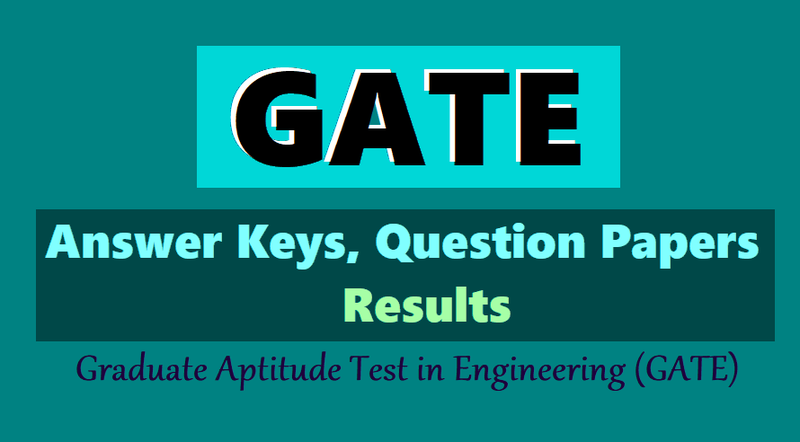 GATE 2019 Answer Keys for all Subjects released on gate.iitg.ac.in / GATE 2019 answer key, question paper released, how to check it: GATE 2019 Answer Keys and Question Papers - IIT Guwahati has released the answer key and question paper of Graduate Aptitude Test in Engineering (GATE 2019) examination on GATE official website at www.gate.iitg.ac.in. The institute had earlier released the candidates responses of the exams. This examination was conducted for 23 subjects on February 2, 3, 9 and 10. Update on GATE Answer Key: Indian Institute of Technology, IIT Madras is expected to release GATE 2019 Answer Key soon. Candidates who have appeared in the written examination can check the answer key from the official site of IIT GATE at gate.iitm.ac.in. The response keys for all papers are available now for candidates to check. The objection window for GATE 2019 Answer Key will be opened after the results are out. Candidates can raise objections on the answer key released. The GATE 2019 examination was conducted on February 2, 3, 9 and 10, 2019. The examination was conducted in two session- forenoon from 9.30 am to 12.30 noon and afternoon from 2.30 am to 5.30 pm. The GATE 2019 score card will be out on May 31, 2019. Candidates who have appeared in the written examination can check their on the official site. For other related information, candidates can visit the official site of the GATE. The examination is conducted jointly by the Indian Institute of Science and seven Indian Institutes of Technology (at Bombay, Delhi, Guwahati, Kanpur, Kharagpur, Madras and Roorkee) on behalf of the National Coordination Board (NCB)-GATE and the HRD ministry. This year GATE is being conducted by IIT Madras . Qualifying in GATE enables candidates to seek admission to or receive financial assistance to master’s programmes and direct doctoral programmes in engineering/ technology/ architecture and doctoral programmes in relevant branches of science in all institutions supported by MHRD and other government agencies. GATE tests the comprehensive understanding candidates in various undergraduate subjects in engineering /technology /architecture and post-graduate level subjects in science. GATE scores reflect the performance level of a candidate in a particular subject, which is quantified based on examination data collected over several years. GATE 2019 scores will be valid for three years from the date of announcement of results. GATE 2019 Answer Keys are now available on the official website. Candidates who have appeared for the Graduate Aptitude Test in Engineering or GATE 2019 conducted on February 2, 3, 9 or 10 can now check the answer keys and the question papers on the official website gate.iitg.ac.in. The direct link to check the Answer Keys and Question Papers for all the subjects is also provided at GATE Website. Candidates would have the facility to raise objections in the answer keys provided. The objection window will be opened in next few days. Candidates can then raise objections through the official site of GATE. The GATE 2019 Score card will be released by the University on May 31, 2019. For other information, visit the official site of GATE. The Question Paper and Answer Keys for various sets (in case of Mechanical and Civil Engineering) are also available. Candidates can check the GATE 2019 Answer Keys here. How to download GATE 2019 Answer Keys and Question Papers?